Horse Facilities, Large Open Gathering Space, Outdoor Living Space, Sunny Area(s), Swimming. Garden View, Hills View, Lake View, Open View, Panoramic, Swimming Pool View, View. 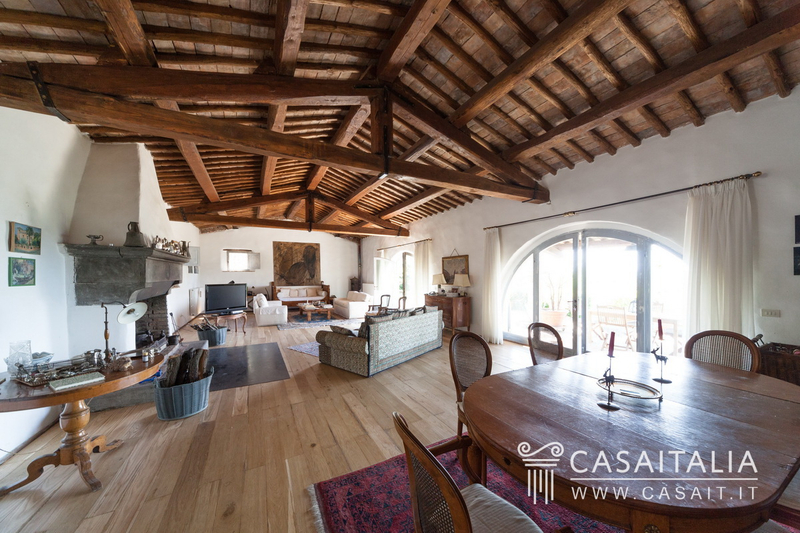 Country villa in panoramic location with view of Lake Corbara and its nature reserve. Measures around 442 sq.m in total with two floors, plus garage measuring 59 sq.m and 20 sq.m covered terrace. Inside there are bright living spaces, 4 bedrooms and six bathrooms. 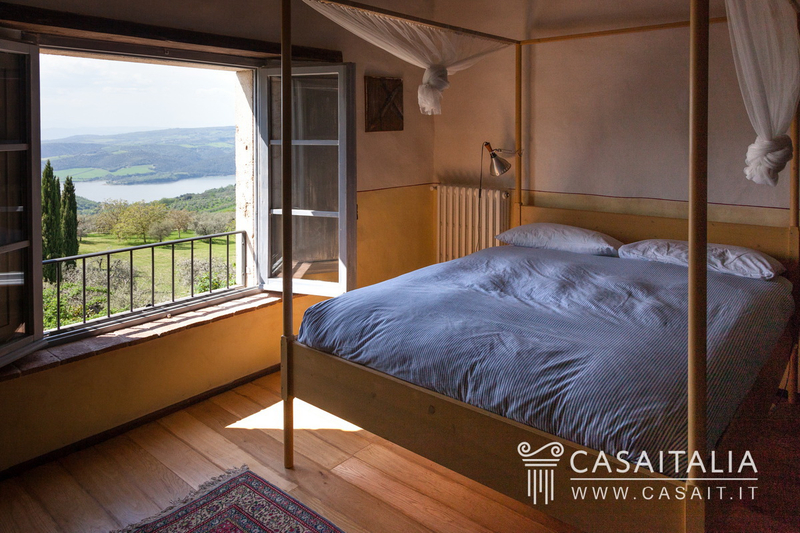 Geographic position Surrounded by the green countryside between Orvieto and Todi, with a view of Lake Corbara and its nature reserve, Country Villa Vista Lago is also in a convenient, easy-to-reach location, just 800 metres away from the country road and 3.5 km from the main road which goes along the lake. 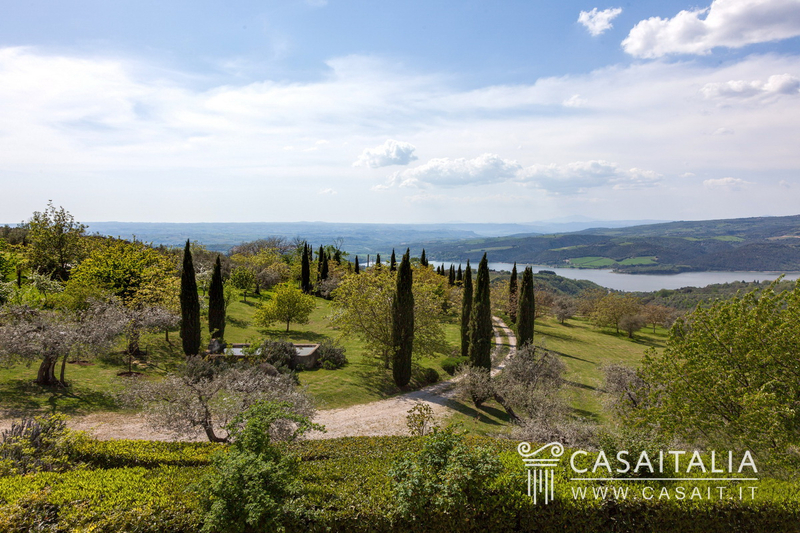 The nearest town is the picturesque village of Civitella del Lago, just 4 km away, while it is almost the same distance to Orvieto (20 km) and Todi (26 km), both just over 20 minutes away. The A1 motorway junction is 14 km away and allows you to get to Rome (127 km) in an hour and a half and Florence (176 km) in two hours. The nearest airport is Perugia, less than an hour’s drive (64 km), while Rome Ciampino (143 km) and Rome Fiumicino (187 km) airports are less than two hours away. Description of buildings Built from the renovation of an old 11th century church, Country Villa Vista Lago has two floors and measures around 442 sq.m in total, plus an underground garage measuring 59 sq.m and a 20 sq.m covered terrace. On the ground floor there is a large living room divided into a sitting room with fireplace and a dining area, the kitchen with exposed stone walls, fireplace and large windows overlooking the garden, a bathroom, two bedrooms with en-suite bathroom and fireplace, and an entrance area with stairs to the floor above. 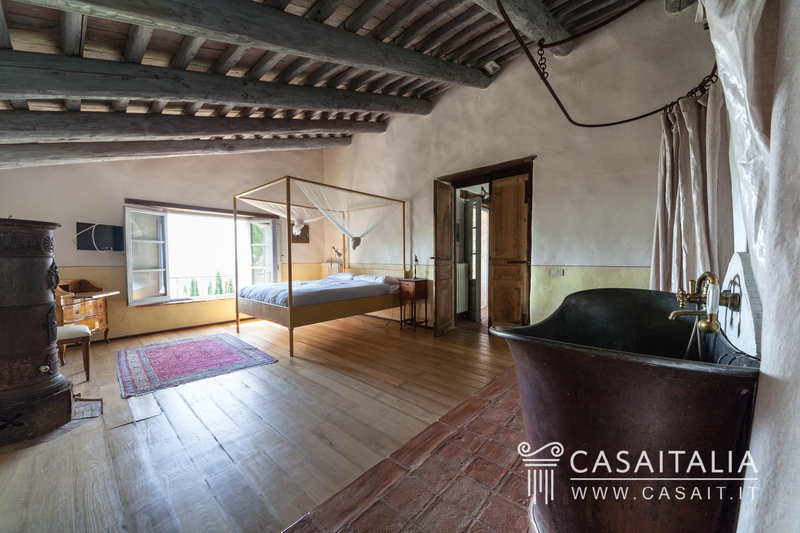 The first floor is home to the sleeping quarters, with two bedrooms with en-suite bathroom and an attractive loggia between them with three arches that overlooks the valley with a stunning view of the lake. Next to the villa there is an underground garage measuring around 59 sq.m with bathroom, and a covered terrace measuring 20 sq.m a short distance away. 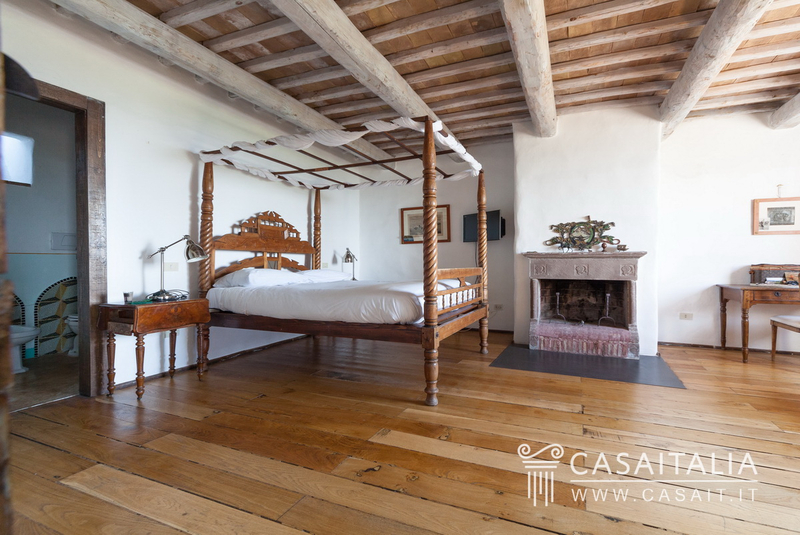 State and finishing The villa has been recently restored with traditional and reclaimed materials of the highest quality. 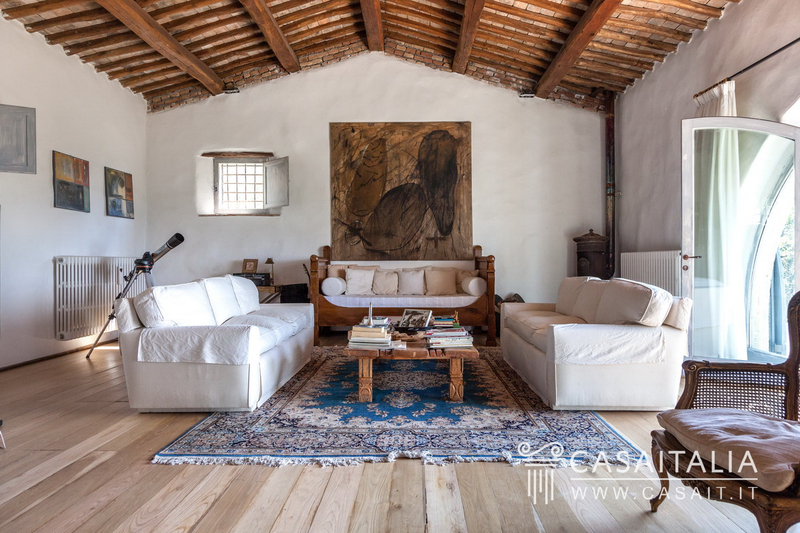 The large windows in the living room provide a stunning view of the garden and create a very bright space with a large feature fireplace, high ceilings with wood beams and tiles and wood floors which can also be found in the bedrooms. 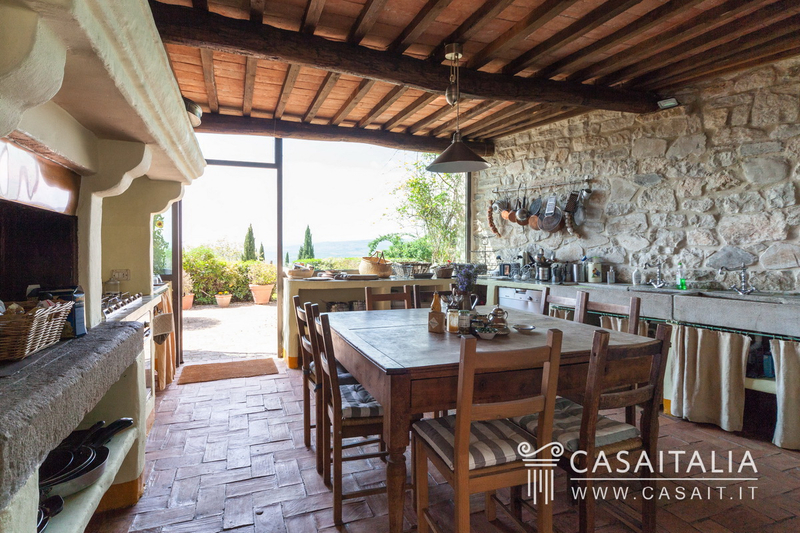 The kitchen has a warm, traditional feel thanks to its tiled floors, exposed stonework, wood and tile ceilings and fireplace. This space also benefits from floor-to-ceiling windows overlooking the garden. Like the rest of the house, the bathrooms are full of character and originality: each one different, the 5 bathrooms inside the villa have been created from carefully chosen materials, such as the siding in coloured mosaic and tiles, or the large copper tub in the napoleonic style in the centre of one of the top floor bedrooms. 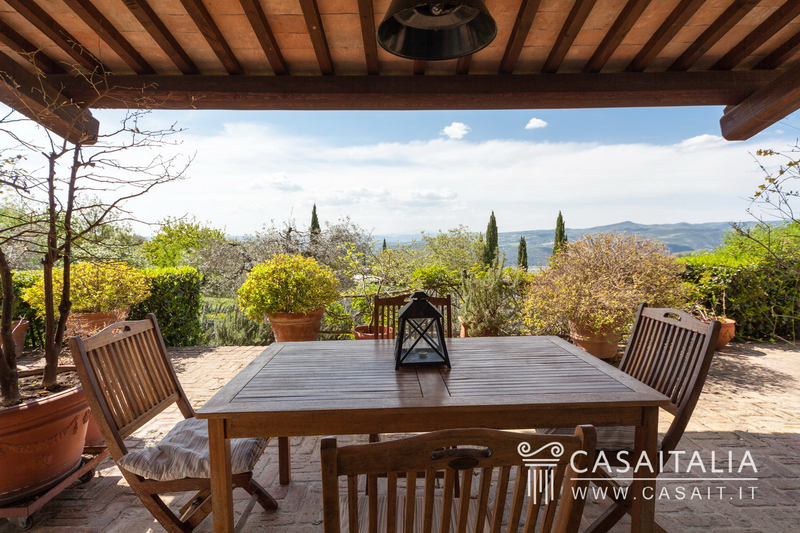 External areas Country Villa Vista Lago is surrounded by 7.85 hectares of private land, which includes a fertile olive grove with around 1000 trees. 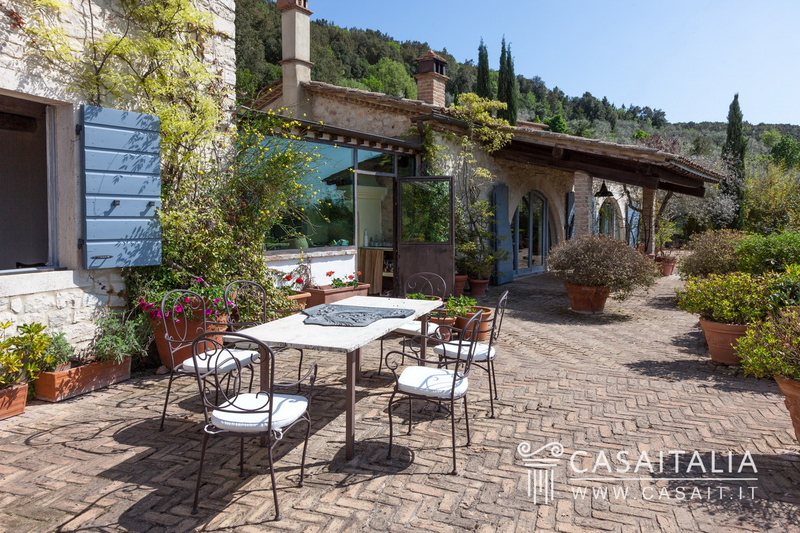 The villa is accessible via two private roads with an entrance gate: the first goes around a pretty walnut grove with around 50 trees and the olive grove, while the other, higher up, goes along a picturesque lane with cypress trees and lavender. In front of the house there is a large paved/terraced area and a lush garden with fruit trees, a spectacular pond and the saltwater swimming pool. 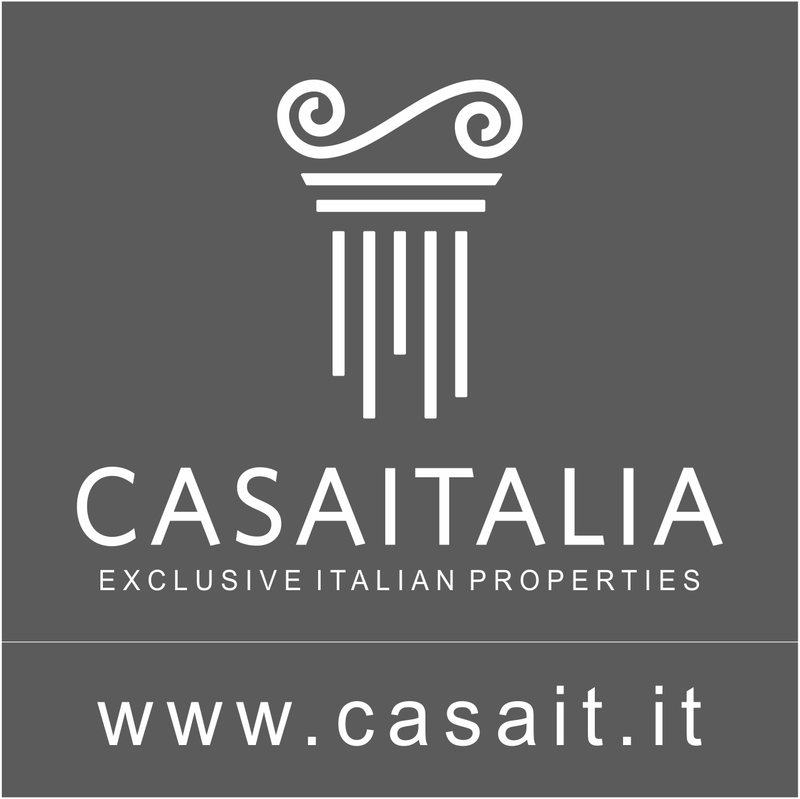 Use and potential uses Country Villa Vista Lago is the perfect property for those who have been dreaming of a home in the countryside, in contact with nature with the chance to have fun making your own olive oil. Its location, secluded and extremely private yet close to a town at the same time, is central in relation to some of Umbria’s important and lively historic centres, and is a short distance from both Rome and Florence (and from Central Italy’s main airports), which also makes it an ideal second home in which to spend weekends or long holidays.